There are many alternative education styles that are equally, if not more, effective as traditional education in a public school setting. Some of these are taught in private school settings but many of them can be translated to a home-based setting, or are better used in a home-based setting. Every child learns in a different way and what works for one child may not work for another. Even within the same household! 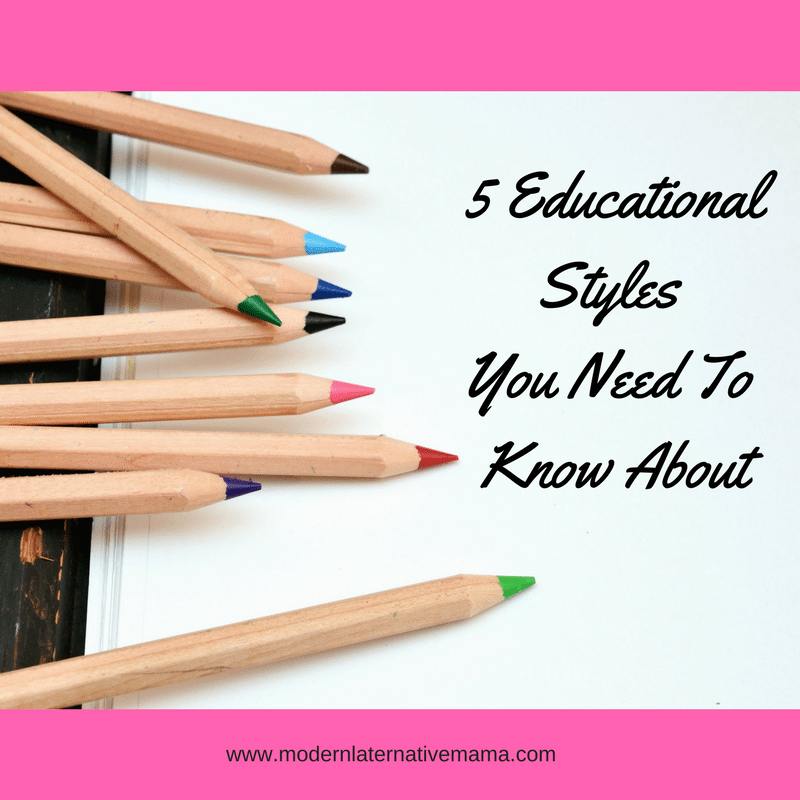 Read on to discover 5 natural education styles you need to know about and how they can be incorporated into your family’s life! Rudolph Steiner was the founder of Waldorf education. He was born in 1861 in what is now known as Croatia and spent a lot of time in interest-led study of his own choosing, then later went on to University and attained his Ph.D. In 1901 he began to form what is now known as Waldorf Education with his wife Marie. In 1919 the first Waldorf School opened its doors to the public. Steiner wanted it to be free so that all children would have access to his new type of education. His brand of education was integrative and the motto of his schools became “heart, hands, and head”, meaning that the child learns best when all of these facets are used together. Waldorf education is geared towards meeting the child where they are at in their development and not forcing concepts upon children whose minds are not ready to receive the information. He is one of a few educational trailblazers who believe that delaying formal academic learning will actually benefit the child, not hinder their educational careers since the information will be presented to them when they are developmentally ready for it. Children who are educated using the Waldorf method will learn normal topics like math and science but will also learn things like knitting, carving, gardening and other things that use the child’s creative side. Born in 1807, Maria Montessori was also an educational trailblazer who enrolled in all-boys classes in her home country of Italy at a very young age in order to study become an engineer. She later changed her mind and instead graduated with her Ph.D. as a physician in 1896. At the beginning of her career, her focus was on mentally disabled children and in 1906 was asked to help some children in a low-income area of Italy become educated. It was there that her style of learning began. Montessori believed that child-sized furniture in the learning environment helps the child to gain confidence in their surroundings, and this confidence is integral in their ability to learn new concepts. Things like low desks, chairs, accessible sinks and toilets are all hallmarks of Montessori. She also believed that, for young children, learning happens through everyday tasks. Students are expected to help with chores like setting the table for meals, wiping the table, sweeping the floor, and feeding animals. She placed low shelves her classrooms lined with trays of “prepared materials” for the children to explore. Each tray had a theme and each theme would help the child to master a skill, such as pouring water into a cup, using tongs to transfer items to and from a container and so on into harder tasks for older children. Charlotte Mason was another visionary woman when it comes to alternative forms of educating our young children. She was born in England in 1842, around the same time as Steiner and Montessori. She was homeschooled by her parents in her younger years and later got her formal training in Education. The Charlotte Mason Method focuses on character building in the child with her motto, “I am, I can, I ought, I will” as the base of her method. There is a large focus on respectful character building rather than discipline. She believed that children deserve respect and need to be taught good character as they would be taught math. She believed that children need high-quality, real materials to learn and don’t benefit from the dumbed-down versions children’s materials that are widely used in other educational formats. She likes “living books” that depict real characters and not hokey cartoon characters. What she referred to as “twaddle”. She uses Unit Studies to incorporate many subjects into the child’s learning all at once instead of separating topics by subject, which is something the Finnish Government is incorporating into their public school systems. Radical Unschooling is a controversial term. In the most extreme versions of unschooling parents believe that children will learn what they want when they want, how they want, and for how long they want. If the child wants to play video games for many hours of the day then that’s ok. If the child wants to spend the whole day reading books then that’s ok too. The focus here seems to be child-lead and mostly unassisted by the parents. People who unschool believe that the child will learn as things become interesting to them and that very little or no direction is needed by the parents in order for the child to learn. Delight-Directed is a natural learning style where you follow your child’s lead in what they are interested in learning and provide them with the resources and guidance they need to learn about their desired topic. Children have a natural urge to learn and if we follow their lead they will often time reach out for guidance on how we as parents can help them learn. In this style of learning it is our job as parents to provide them with the right resources for the child to be successful. This could mean trips to the library for books, museum trips, Googling for information, watching YouTube videos, hiring a tutor, going outside to explore how animals move in the forest and workbooks if the child desires that. What Delight-Directed learning is not? Sitting at a table for hours doing repetitive worksheets. Memorizing facts to be repeated on a test. Pre-packaged curriculum not formulated for your specific child. Spending too much time indoors and not enough outdoors. This style of learning will feel naturally for your child, but how do you know it’s right for you as the parent? If any of these ring a bell then Delight-Directed learning might be what you’re after. You’ve spent hours researching curriculum but don’t like any of them. You don’t like a rigid daily schedule that involves many hours of dedicated “teaching” time using only books. You feel like every moment is a teaching moment and often find yourself derailing your own set schedule for the day because you stopped to “teach” them something along the way. Have you ever considered sending your child to a private school or homeschooling as an alternative form of learning? Do you currently homeschool? If so, what method do you use?